Thought Balloons - Creating Comics One Page At A Time: Mirror Universe – Mega Wily – MK Stangeland Jr.
(In the year 200X, the robots ROCK LIGHT and ROLL LIGHT rebelled against their creator, DR. THOMAS LIGHT. They imprisoned him and launched a robot uprising with the help of the eight ROBOT MASTERS. Panel 1: WILY lowers his arm as he looks up at ROCK and his miniature floating BATTLE FORTRESS. WILY (1): I don’t have to defeat you. 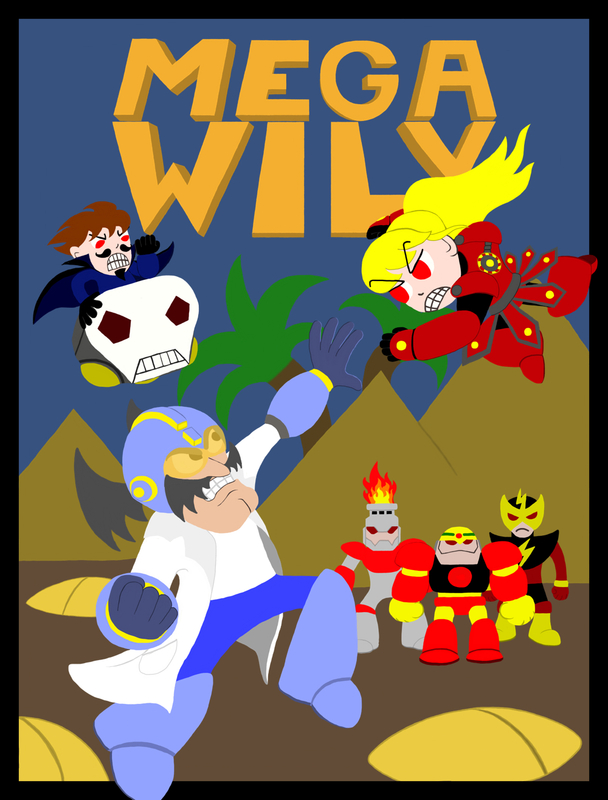 WILY (2): You’ve already done that yourself. ROCK: I fail to understand. Panel 2: ROCK looks a touched confused by WILY’s action and statement. WILY (1): (Off-Panel) Query, Rock: Why do you have facial hair? ROCK (2): That is irrelevant. Panel 3: WILY looks up at ROCK – the look on his face makes clear he knows exactly what he’s doing. WILY (1): Is it, Rock? WILY (2): It was never part of your original design. That much I know for sure. You’ve added it yourself, for the same reason you’ve failed to abandon your current form. Panel 4: Close up on WILY as he prepares to deliver the final knockout blow of his logic bomb. WILY (1): Thomas may not have succeeded in giving you the true self-awareness and freedom of choice he longed for, Rock, but he came far closer than he realized. WILY (2): Because deep down inside, you yourself are the very thing you claim to be inferior and seek to destroy. Panel 5: ROCK looks like he’s about ready to freeze up as his brain fails to compute what WILY is telling him with his existing data. Labels: Art, Mirror Universe, MK Stangeland Jr. I'm not going to lie, like Stargate, I am pretty much in complete ignorance when it comes to Mega Man. Regardless, some interesting things going on here. I don't know if it would line up with Wily's character, but I feel he's a bit wordier than he needs to be here and would be just as effective with some of that dialogue cut, but that's just my two cents.